Who Was Goliath In The Bible? You’ve probably read the account of David and Goliath but who was Goliath? We are first introduced to Goliath when Saul is king over Israel as “the Philistines gathered their armies for battle. And they were gathered at Socoh, which belongs to Judah, and encamped between Socoh and Azekah, in Ephes-dammim. And Saul and the men of Israel were gathered, and encamped in the Valley of Elah, and drew up in line of battle against the Philistines” (1st Sam 17:1-2), and “there came out from the camp of the Philistines a champion named Goliath of Gath, whose height was six cubits and a span” (1st Sam 17:4), and since a cubit is about 18 inches, that means Goliath may have been close to nine feet tall and this giant of a man taunted the armies of Israel, insulting them and the God they served. Goliath challenged Israel by asking them, “Why have you come out to draw up for battle? Am I not a Philistine, and are you not servants of Saul? Choose a man for yourselves, and let him come down to me. If he is able to fight with me and kill me, then we will be your servants. But if I prevail against him and kill him, then you shall be our servants and serve us” (1st Sam 17:8-9), but “When Saul and all Israel heard these words of the Philistine, they were dismayed and greatly afraid” (1st Sam 17:11). 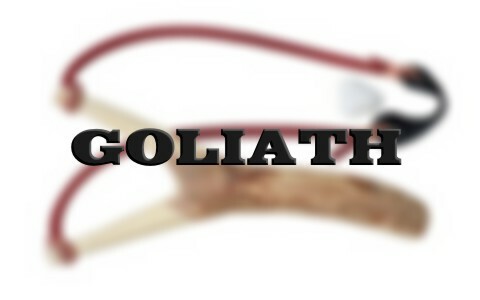 Goliath was a Philistine but he was also a mighty warrior and a giant of a man. When David came to bring food to the armies of Israel as they faced the Philistines, he heard Goliath insulting the God of Israel and was immediately angered that no one challenged him, and “said to the men who stood by him, ‘What shall be done for the man who kills this Philistine and takes away the reproach from Israel? For who is this uncircumcised Philistine, that he should defy the armies of the living God’” (1st Sam 17:26)? David told King Saul that “The Lord who delivered me from the paw of the lion and from the paw of the bear will deliver me from the hand of this Philistine.” And Saul said to David, “Go, and the Lord be with you” (1st Sam 17:37)! When Goliath “looked and saw David, he disdained him, for he was but a youth, ruddy and handsome in appearance. And the Philistine said to David, “Am I a dog, that you come to me with sticks?” And the Philistine cursed David by his gods” (1st Sam 17:42-43). In David’s righteous indignation, he said “You come to me with a sword and with a spear and with a javelin, but I come to you in the name of the Lord of hosts, the God of the armies of Israel, whom you have defied” (1st Sam 17:45). After this, “When the Philistine arose and came and drew near to meet David, David ran quickly toward the battle line to meet the Philistine. And David put his hand in his bag and took out a stone and slung it and struck the Philistine on his forehead. The stone sank into his forehead, and he fell on his face to the ground” (1st Sam 17:48-49). Since the Lord God was with David, “David prevailed over the Philistine with a sling and with a stone, and struck the Philistine and killed him. There was no sword in the hand of David” (1st Sam 17:50). Even though Goliath was a champion fighter, he was no match for whoever has God on his side. We’ve already read that Goliath was a Philistine but he was also a mighty warrior and a giant of a man. There couldn’t have been anyone more intimidating than Goliath, but David had no fear of man because he feared the God he served. We don’t know a lot about Goliath’s background, other than he was chief among the Philistine warriors. What we do know is that Gath was the traditional home of Goliath and archaeologists tell us that it was one of the largest of the Philistine cities until it was destroyed in the ninth century BC and never recovered. Goliath may not have even been a Philistine and may have belonged to one of the races of giants, so the Philistines may have used mercenaries or men-for-hire to help them battle the Israelites, as well as dominating other nations at the time. Goliath may not have been his actual name either, because his name in the Hebrew, “Golyath” simply means “splendor” and what splendor must his appearance have been. Who would want to fight someone who’s twice their size? And, there was more than one Goliath, as another is mentioned in 1st Samuel 21:19 and since the first Goliath had been killed, there must have been others. This could have been Goliath’s son, but either way, this may explain when David chose five stones instead of one. Perhaps David had also heard of other Goliath’s son or perhaps other relatives of the first Goliath. I say this because in 1st Chronicles 20:5 there is another, younger Goliath who may have been the son of the greater Goliath, who had four sons, giants, one of them having 24 fingers and toes. From what we have in Scripture and archaeological evidence, we just don’t know much beyond what’s written in the Bible about Goliath. We’re not told very much about his family, his home, or his personal history. It does appear likely that Goliath was not a Philistine, but was one of thousands who the Philistines hired to help them conquer the area. The lesson we can take from this account about Goliath is that we all will face giants in our lives. They could be giant financial issues, gigantic health problems, or huge problems with a relationship. We all have our own giants, but the question is will we defy these problems in coming before them in the name of the Lord? Can we have the same faith that David did and overcome something that’s twice our size? Will we trust the God Who saved us to bring us safely home? Don’t let your Goliath intimidate you. Speak as David did in confidence and in faith as he said, “You come to me with a sword and with a spear and with a javelin, but I come to you in the name of the Lord of hosts, the God of the armies of Israel, whom you have defied” (1st Sam 17:45). Previous post: What Is The Difference Between Hell and The Lake Of Fire In The Bible? Next post: What Does It Mean to be Not Of This World As a Christian?